Karen Armstrong’s short, eight chapter opus, attempts to take in several thousand years of history, showing an evolution of the Bible from oral tradition, to written inception, to various different readings and philosophies. 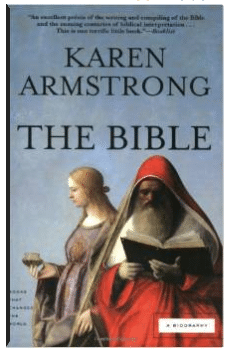 Karen Armstrong, respected historian now, is also an ex-Roman Catholic nun who left the faith after her horrible treatment in the pre Vatican II era. As such, readers who find out the history of the author are a little weary that her own unfortunate treatment (simply unforgivable when you read her back history) might color her perception of religion. While I, as a reader and an amateur Biblical scholar seeking to strengthen my faith with knowledge of all arguments both for and against Christianity, cannot speak to either the sincerity or knowledge of Ms. Armstrong, the representation of her theorems as factual and the supposed 100% understanding of every moment that occurred in the Biblical history undermines her authority, especially since she speaks her ideas as gospel and does not reference other scholars or interpretations (with the exception of a lengthy appendix which takes up the second half of the otherwise, short book.) If readers were to jump to this appendix for reference, it would be effectively useless as it functions as a bibliography more than an in-depth analysis of Armstrong’s sources and their beliefs/positions. As such, we have witness to a dogmatic history, more fiction than fact, as told by what one person presumes to be the truth. A few minutes of googling will punch holes in many of the early theories of Armstrong’s first chapters, which prove to be from 25 years ago and not current with modern thoughts on the Bible. So, The Bible: A Biography is a very one-sided ride through history with an unreliable narrator who, frankly, oozes egotism presuming that she holds the keys to all Christians’ (and Jews’ and Muslims’ for that matter) faith, answering questions with authority that others remain baffled about or see in a completely different light, stating everything as fact without mentioning that this, as with many other scholarly works on various different religions, is just one way to see the Bible – one interpretation that is not a solid fact. The author’s unreliability and lack of true evidence (where is she getting these “facts” – and slopping that in an appendix that 99.9% of people won’t read is not a true answer), gives readers a wary sense throughout, limiting the author’s authority on the questions. Her own dogmatic approach, for instance calling the Gospel of John “toxic,” representing both Jewish and Christian faiths as cults, stating that Biblical stories are all myths, etc., and praising ancient peoples for – apparently – being “smart enough” to interpret the Bible in a way that suited the needs of their community at the time instead of appealing to it as a steady sacred text, transforming it into a useful panacea for the common people, seems opinionated. Christians aren’t the only ones that receive this particular scholarly backhand – the Jewish religion, including Jewish mysticism, and other offshoots are dealt with in an equally cavalier manner. Rabbis throughout the centuries are praised for realizing that the Bible isn’t “sacred;” it’s just a book, built by men, to deal with the issues of their time and as such can be re-interpreted and re-used to offer up modern answers to modern problems. It’s just one of those calming little devices, like the cute little squeezy things you keep on your work desk for stress, and seen in this light, Armstrong thinks the Bible (both Torah and what Christians consider Old and New Testaments) is a jolly good thing. While Armstrong does make some valid points (for instance, there is ongoing speculation regarding the authors of the Bible and the moments where it seemingly contradicts itself) her answer, elegantly interwoven into complex scholarly language, just says the same thing over and over again. It never was a religion and never was real. Only crazy fundamentalists see the scriptures as pointing toward a savior or a way of spiritual life – and according to Armstrong those that founded the Bible would strongly agree with her. Once again, it was a convenient panacea for the time, even a political tool. Others chose to keep it around throughout the centuries because, if you just re-interpret it, you can supposedly make it say anything, therefore continuing the use of the Bible changing for man and not vice-versa. I don’t think that I need to, as a devout Christian, state my beliefs here. It’s evident from my own write-up that I don’t agree. Readers, however, who want to consider Armstrong’s point of view or at least explore this possibility will be disappointed because it is all presented as fact, but there is no evidence – no research. We’re asked to take the author’s word for it, a word that she states as unbending fact. As all scholars should know – you could be, and probably are, wrong about some things. Armstrong does not have this humility or share the reasoning and logic behind her presentation of the Bible, leaving this to be a thick little packet of dogma with no support. Jews, likewise, probably won’t be too happy with what they read in this book, since it likens their faith to Christianity, and Islam, saying that the three are indistinguishable and all, of course, just adapted to keep various groups in their happy place. The history of Judaism, which takes up a surprising amount of page space, is just as unsupported as the history of Christianity, and all three groups are not going to like the manner in which they are represented without proof, without text, without anything more than an assumed authority from an author who chooses to make an argument without first building any foundation of authority and even choosing old, discarded theories that are no longer even considered by Biblical scholars. If the Bible is just something to interpret based on whim, as Armstrong’s book suggests, then I suppose we can just interpret her evidence as her own whim and the panacea that she needed for the time, and therefore go out and all make our own books and our own “research” which is based off what we want to hear without backing anything up with those pesky resources or historical evidence. Oh, and do have a Google at all the obvious historical facts which she gets wrong, because apparently interpretation can shift the world on its axis not just in that vague spiritual realm, but in the solid lines of historically recorded dates as well. Looks like everything is open to mean anything, so give this book a skip and make-up your own world view.